If you need to quickly add a component without navigating to Palette, press Shift Space. This brings the Add component dialog. Components are searched by their name and description. You need to sort your data, but CloverDX offers various sort components. A quick solution: press Shift+Space and type 'sort'. You will see all available sorters (with a description). Figure 30.1. 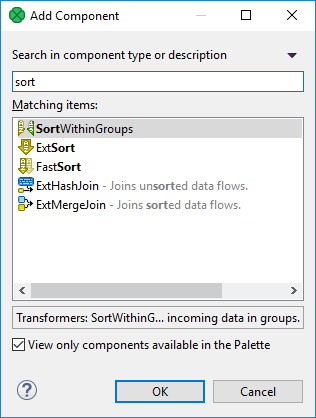 Add Components dialog - finding a sorter. For easier access, recently searched/added components appears at the top of the dialog.